but a fashion icon too. Some (of Hollywood’s) most successful stars owe a lot to their on-screen style. 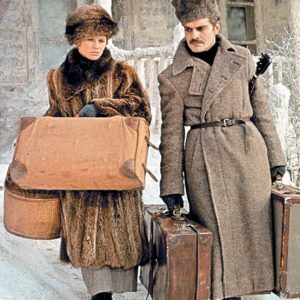 Dr Zhivago elevated Julie Christie to star status, and her breathtaking wardrobe of fur coats, hats and romantic white gowns was used to illustrate social change in a Russia torn apart by war, revolution and ideological upheaval. FACT: The film won five Oscars, including Best Costume Design. This infamous shot of Marilyn Monroe’s halterneck white dress blowing up around her legs as she stands over a subway grating was originally shot on Manhattan’s Lexington Avenue for a scene in The Seven Year Itch. Onlookers whistled and cheered through take after take as Marilyn repeatedly missed her lines – and eventually the scene had to be reshot in a studio. FACT: The dress sold at auction for $4.6 million. 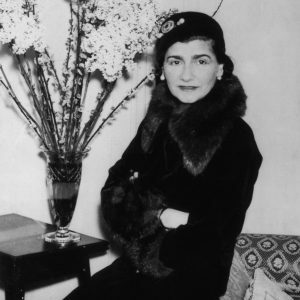 Audrey Tatou’s turn as Gabrielle Chanel focuses on the period in the designer’s life before she became the legend we know her as today. Breakfast at Tiffany’s may be the Audrey Hepburn film most often cited as people’s favourite (and of course Holly Golightly´s black gown), but her chic fifties outfits in Roman Holiday are just as iconic – think skipping around Rome in a dirndl skirt and espadrilles. FACT: The film inspired a true fashion fairytale – at the end of production, Paramount gave Audrey the entire wardrobe from the film, including her hats, shoes, handbags and jewellery. Ursula Andress became the quintiessential Bond Girl when she emerged from the Caribbean sea in that belted bikini in Dr No and revealing her wild side with a leopard (printed) coat & boots. Sharon Stone won an Oscar for her role in Casino as Ginger, the devious wife of high rolling gambler, but it was her flashy, sequinned Las Vegas wardrobe that stole the show. FACT: The costume budget for the film was $1 million, and Sharon had 40 costume changes. The white and gold dress pictured weighed a whopping 45 pounds. Margot’s offbeat wardrobe of fur coats, vintage bags and Lacoste tennis dresses, showed Gwyneth Paltrow in a whole new light in The Royal Tenenbaums. FACT: Director Wes Anderson wanted to make the Tenenbaums appear “trapped in the era of their heyday”, so made sure all clothes were from the 1970s and characters stayed in the same or similar outfits throughout the movie. The thigh high boots! The $250,000 diamond necklace! The off-the-shoulder red gown! The Rodeo Drive shopping spree! Everything! FACT: Roberts admitted she kept the polka dot ensemble (from the polo scene) to keep on eye on her figure – and can still fit into it. Though there are countless lust-worthy coats to choose from in this film, Anne Hathaway’s belted white coat takes the cake. It’s the perfect example of how to make the white work for wintertime. Don’t we all wish we had an oversize furry to simply throw on over our pajamas on New Year’s Eve—and look just this amazing?